1. If not using instant dashi, simmer mushroom in water in a small saucepan, covered, 15 minutes. Add kombu and barely simmer, covered, 5 minutes. Remove from heat and let stand, covered, 5 minutes. Strain through a fine-mesh sieve into a large glass measure, pressing on and discarding solids. Return 2 cups liquid (add water if necessary) to saucepan. 2. Add soy sauce, mirin, ponzu, sugar and bring to a boil, stirring until sugar has dissolved. Remove from heat. Stir in sesame oil, then cool. Note: Sauce can be made 3 days ahead and chilled. 1. Steam (or blanch) snow peas over a large pot of unsalted boiling water until crisp-tender, about 4 minutes. Transfer with a slotted spoon to a large colander set in ice bath to stop cooking (I skipped this). Lift colander to drain. Transfer snow peas to a bowl. 2. Steam baby bok choy for approximately 4 minutes. Transfer with a slotted spoon to a large colander set in ice bath to stop cooking (I skipped this). Lift colander to drain. Transfer to a bowl with snow peas. 3. Meanwhile, return water to a boil. Blanch or steam spinach until just wilted, about 30 seconds, then cool and drain in same manner. Squeeze out excess water. Add to snow peas. 4. 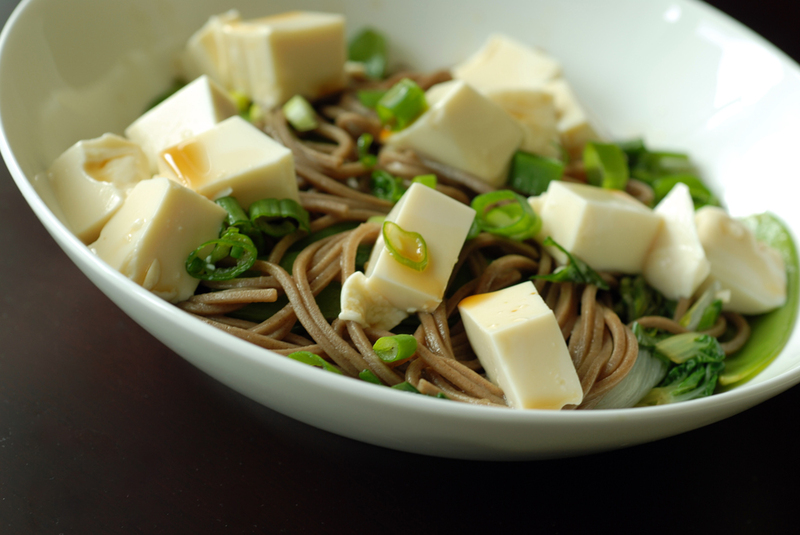 If you can manage all that steaming at once, try to boil your soba noodles as per the package directions (likely 6-8 minutes once water returns to a boil) under the steamer, stirring occasionally, until tender. Drain in colander and rinse with cold water. Cool in ice bath until very cold (add more ice to water as necessary, but I still skipped this step). Drain well. 5. Carefully drain tofu and pat dry. Cut into 3/4-inch cubes. 6. Whisk sauce, then pour 1 1/2 cups sauce into a large bowl. 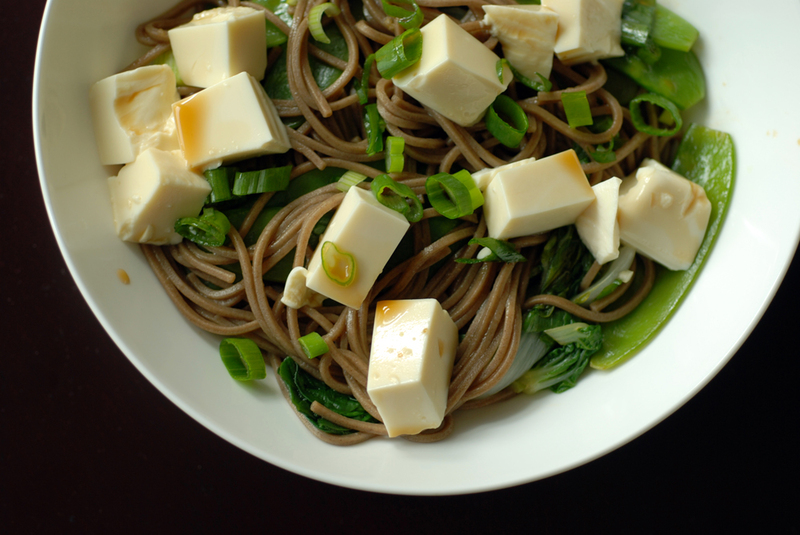 Add noodles, snow peas, baby bok choy, spinach, and half of scallions and toss. 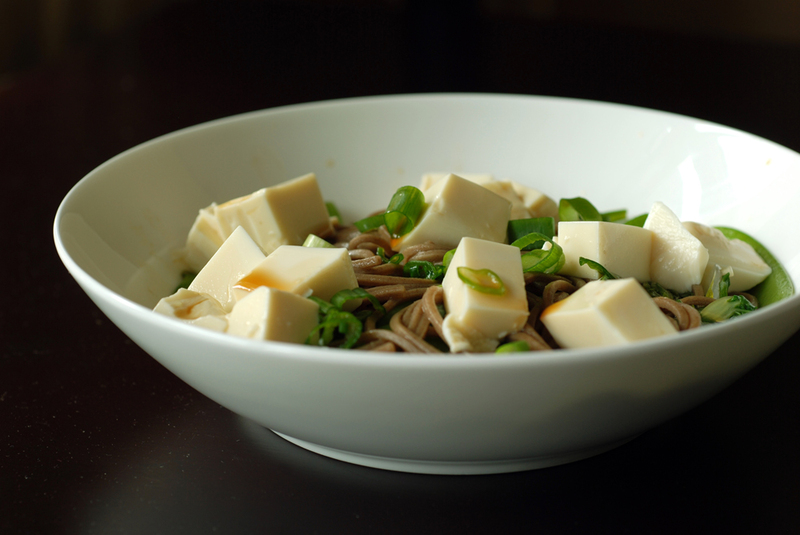 Serve in shallow bowls, topped with tofu, remaining scallions, and ginger. Drizzle with some of remaining sauce and serve remainder on the side. I love all the fresh spring vegetables. Looks both pretty and delicious! What a great site! So glad you decided to join Presto Pasta Nights – and I do hope to see you and your gorgeous dishes, complete with fantastic info, at many more. What a beautiful dish! I love that you can substitute any veggies into it. it is quite perfect for spring. Lovely recipe – perfect for a warm summer day!! Those photos are just gorgeous, Janet! I could just dig right in! Very nice summer salad. Very beautiful photos too.